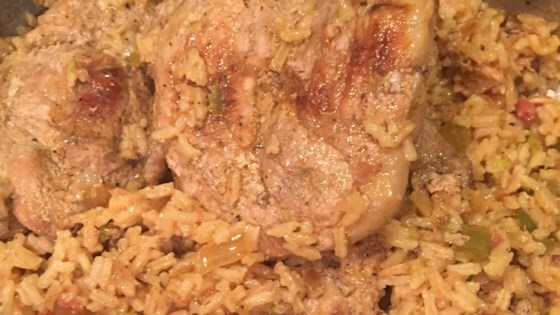 "Fried pork chops over bacon and chicken-flavored rice." Cook bacon in a large skillet over medium heat until crisp, about 10 minutes. Remove the bacon slices to a plate lined with paper towels to cool, retaining bacon drippings in the skillet. Crumble the cooled bacon. Lay pork chops into the reserved bacon drippings in the skillet; season with salt and black pepper. Cook pork chops until completely browned, 3 to 5 minutes. Remove pork chops to the paper towel-lined plate. Stir rice, onion, and garlic into the drippings remaining in the skillet. Cook and stir until the onions are tender and the rice is slightly browned, 5 to 7 minutes. Pour chicken broth over the rice mixture; add crumbled bacon and cayenne pepper. Bring the mixture to a boil. Return the pork chops to the skillet. Sprinkle rosemary and thyme over the pork chops. Reduce heat to medium-low and cook at a simmer until the broth is absorbed into the rice and the pork chops are no longer pink in the middle, about 20 minutes. Delicious! This dish was really easy and had lots of flavor. I did reduce the cayenne pepper a little bit; I think it would have been a bit too much if I wouldn't have. My family loved it! I left out the cayenne pepper & had to cover the rice, add more broth & simmer twice as long to cook the rice all the way but was well worth it! Thanks for sharing this! Note to self: Check other reviews before cooking. Need to cut back on the cayenne pepper. Other than that it is good recipe.